Angel Island has been called the Ellis Island of the West. The immigration station there was in operation from 1910-1940. The Angel Island Immigration Station Foundation (AIISF) promotes a greater understanding of Pacific Coast immigration and its role in shaping America’s past, present, and future. Currently, AIISF is asking for help in locating Jewish refugees who came to San Francisco in the late 1930's and 1940, and their descendants. As restrictions tightened against Jewish people in countries under Nazi control, several hundred Jews applied for entrance to the United States. After traveling across Russia to China and Japan, they boarded ships bound for San Francisco. Dozens of people ended up at the Angel Island Immigration Station, underwent medical inspection, and were detained for weeks because they did not have sufficient funds to reach their intended destinations. 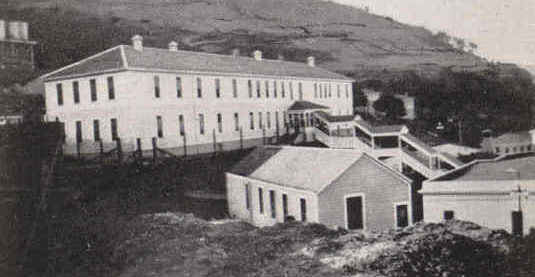 On its Web site, AIISF hosts a database with information about 132 Jewish immigrants who were processed at Angel Island Immigration Station. The database was compiled by volunteers who reviewed files at the National Archives branch in San Bruno, California. Please contact AIISF at info@aiisf.org or (415) 262-4429 if you recognize any of the individuals listed in the database. AIISF would like to interview the individuals or their descendants in order to get their full stories. The database also contains names and short profiles of Jewish refugees who came through Angel Island prior to 1939. Large numbers of Jews left Russia, Poland, and Lithuania after 1915. Many were men who left their homelands to avoid military conscription. Families also fled because of anti-Jewish violence. Many of the families were able to enter the United States with the help of the Hebrew Immigrant Aid Society.